Maly Yeung doesn’t really want to see me. She’d rather be cooking. But after finishing up a batch of chicken fried rice in the kitchen she makes her way through the café and sits down at my table with a smile. On the menu for today’s interview: Sunterra soups. 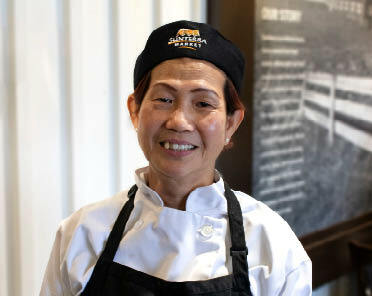 If you’ve shopped at the West Market Square location in the past 14 years, you’d probably recognize Maly. Or the sound of her voice at least, her laughter tends to ring through the market. Maly is what you might call a character. But she’s also an excellent cook, and the creator of Sunterra’s top selling Thai chicken coconut noodle soup recipe. Maly’s heritage is Chinese but she was born in Vietnam so her recipes are not always traditional, she admits. The Thai chicken coconut noodle soup for example is a blend of Vietnamese, Thai and Canadian style she says. Thai food always has a lot of lemon and spice, Maly tells me, but the version of soup she created for Sunterra is not too sour and not too spicy; the perfect bath for a generous pile of rice noodles. “We ask our Team Members for recipe ideas and we try to be authentic based on their background,” says Standardization Chef Raj Nandamudi. That’s why Sunterra serves a Polish-style borscht, he explains - the recipe is from Keynote Team Member Barbara. Her Polish borscht is more than just beets, it’s balanced out with potatoes, cabbage and carrots. And the secret ingredient? Extra vinegar makes the soup bright and lively says Raj. Besides recipe collaboration, the chefs also help Raj decide which soups to serve by giving him feedback from customers, he says. 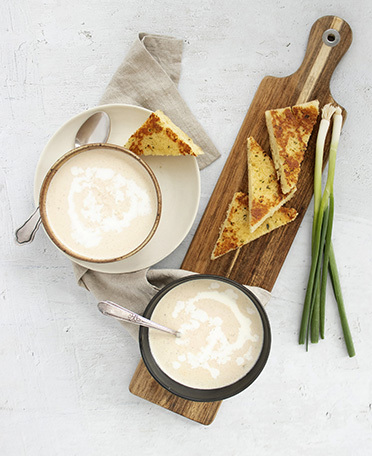 As a result, Sunterra offers four soups each day with the varieties constantly rotating. This includes vegetarian, dairy-free and wheat-free options. All the soups are made with from-scratch stocks, says Raj. Whether it’s beef, turkey, chicken or vegetable stock, the chefs minimize waste by using all parts of the plant or animal such as beef marrow bones or vegetable trimmings he says. If you’re making your own veggie stock at home, Raj recommends scrubbing and washing the trimmings and using a vegetable to water ratio of 1:2. And no matter what kind of stock you make, never boil it, he warns. You won’t get the flavours coaxed out and any fat will emulsify into the stock and make it taste oily. Instead, simmer low and slow and skim the fat off the top of the stock. 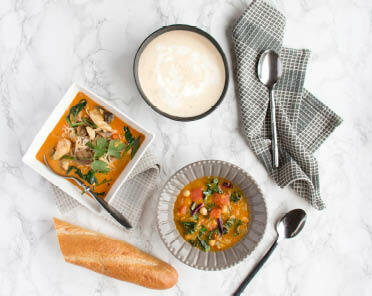 You can find homestyle recipes of Maly’s Thai chicken coconut noodle soup and Barbara’s borscht and perogy soup online at sunterramarket.com/recipes.